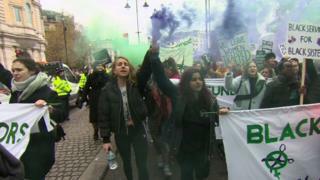 Image caption Sisters Uncut said support services were "bridges to help survivors escape abuse"
A central London river crossing was shut down by activists protesting against cuts to domestic violence services. Sisters Uncut staged a sit-in on the centre of Waterloo Bridge meaning traffic was backed up on both sides. The group said two out of three women are turned away from refuge shelters in London and that black, disabled and migrant women are adversely affected. Bristol, Newcastle, Glasgow and Brighton also saw similar protests. The London protest started in Trafalgar Square, before moving on to Waterloo Bridge. The group said domestic violence support services were the "bridges to help survivors escape abuse and access a line of safety". Minister for Safeguarding, Vulnerability and Countering Extremism Sarah Newton said: "Domestic abuse is an appalling crime that shatters lives and has no place in a Britain that works for everyone. "All victims of domestic violence are equally entitled to the protection of the civil and criminal law while in the UK." It said local authorities could bid for a share of a £20m fund to help increase refuge spaces but Sisters Uncut said this meant services had to "fight each other for funding" and that it was "treating life-saving support like a prize to be won". The group was on the bridge for an hour but Transport for London said the bridge was blocked to traffic for 20 minutes.